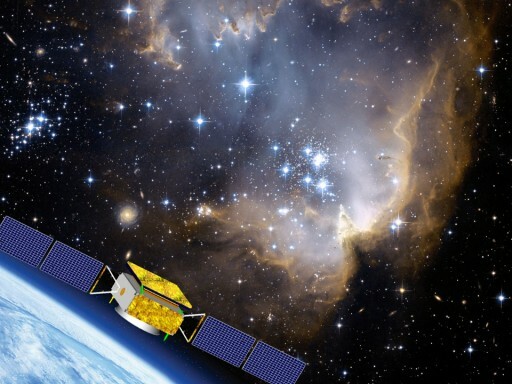 DAMPE, the Dark Matter Particle Explorer, is an astrophysics observatory operated by the Chinese Academy of Sciences as one of five missions initiated under the Strategic Pioneer Research Program in Space Science. The DAMPE spacecraft hosts four instruments for the detection of high-energy gamma rays, electrons and other cosmic particles to continue filling in gaps in high-energy astrophysics by deploying the deepest detector to date, enabling the mission to measure the highest energies in the particle universe in the ongoing quest for an understanding of dark matter signatures. The DAMPE spacecraft hosts a powerful telescope featuring a stacked design of Plastic Scintillator Detectors, Silicon Tungsten Trackers, a deep Bismuth-Germanate Calorimeter and a Neutron Detector with a total radiation length of 33. 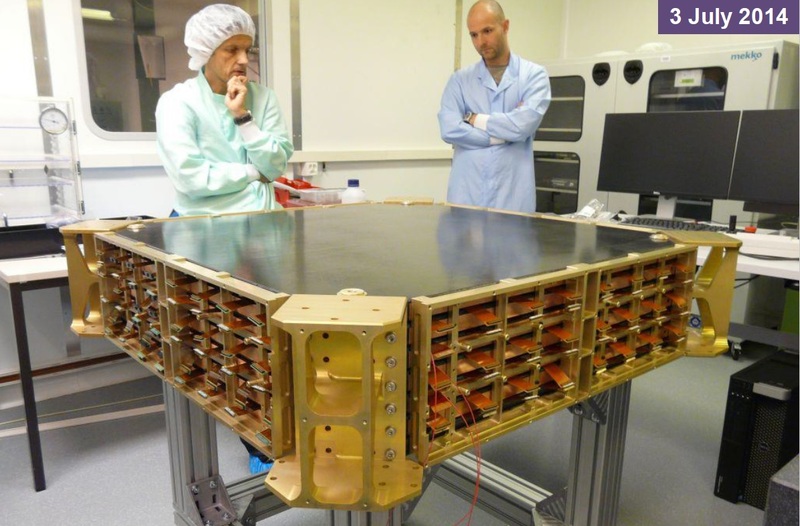 DAMPE’s prime instrument surpasses the Alpha Magnetic Spectrometer 2 deployed on the International Space Station in terms of its detection range for electron and gamma rays by one order of magnitude. The DAMPE research mission is the result of an international collaboration of institutions from China, Switzerland and Italy as well as a number of universities and particle physics institutions including support from CERN. 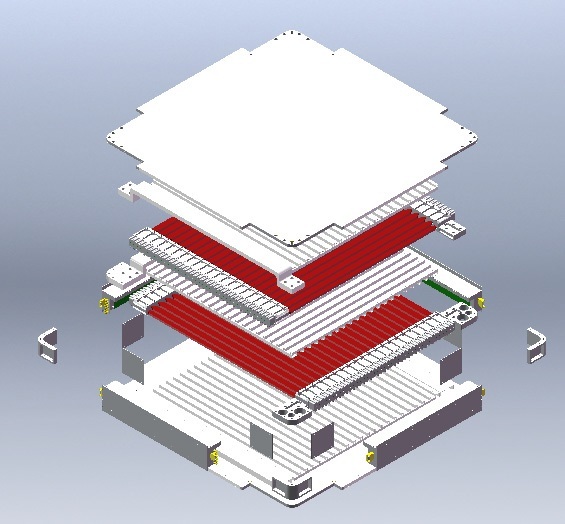 The satellite finished its initial design phase in 2011 and was approved for construction for a late 2015 launch date. 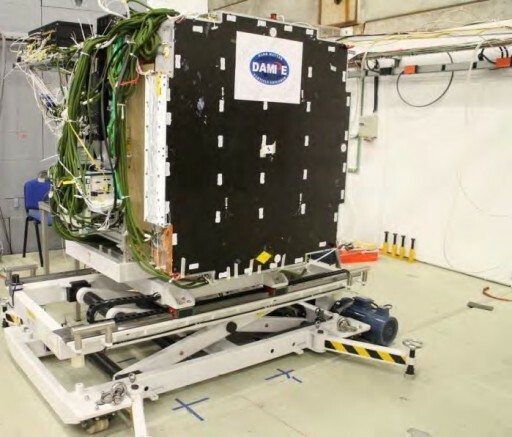 The objectives of the DAMPE mission are to search for Dark Matter signatures by studying electrons and gamma-rays, to examine the cosmic ray spectrum and to conduct high-energy gamma-ray astronomy. Dark matter is a hypothesized form of matter that is necessary to account for gravitational effects seen in extremely large structures, e.g. anomalies in the rotation of galaxies and gravitational lensing of light by galaxy clusters which can not be explained by the quantity of the observed matter alone. Furthermore, DAMPE aims to extend the energy range of space-based particle detectors to the Terra-Electronvolt region, also providing a higher energy resolution. 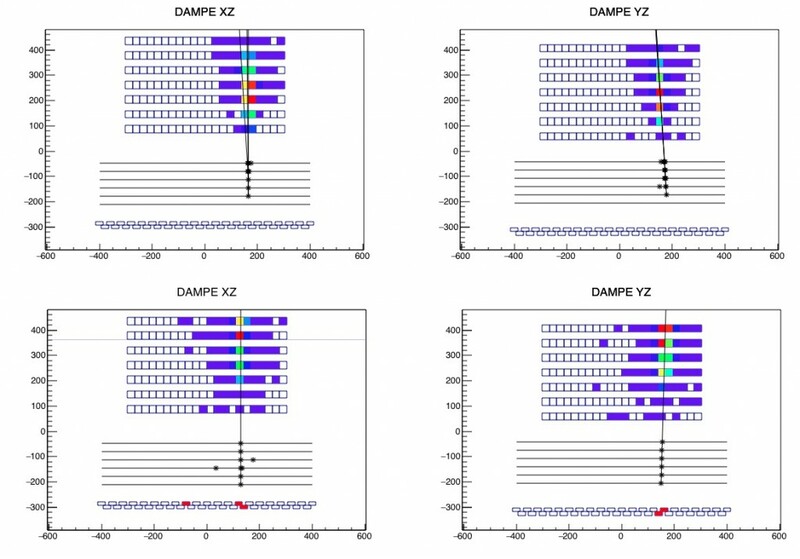 DAMPE acts as a follow on mission or extension to the Fermi and AMS-02 missions and complements measurements from the CALET instrument deployed on the outside of the International Space Station in 2015. The study of the anisotropy of energetic particles in different energy ranges can deliver valuable insight in the nature of cosmic ray sources. Generating spectra of cosmic particles at lower energies and also provide information on the propagation and acceleration of cosmic rays. The DAMPE satellite has a mass of a little under 1,900 Kilograms, making it suitable for the Long March 2D rocket that is tasked with delivering the spacecraft to a 500-Kilometer Sun Synchronous Orbit inclined 97.4 degrees. 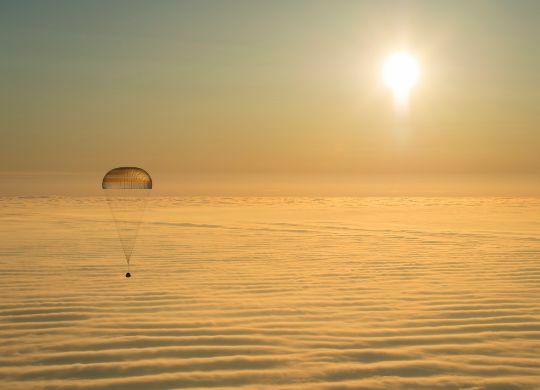 The spacecraft is outfitted with two-power generating solar arrays providing a total power of around 850 Watts. The satellite, using a combination of aluminum and carbon fiber reinforced plastic for its structural system, hosts a total payload mass of approximately 1,480 Kilograms. 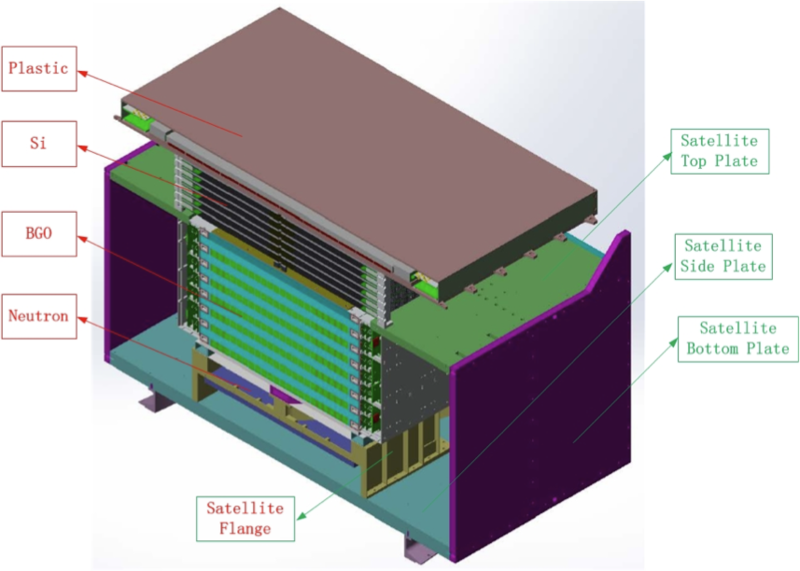 The high-energy detector system of the DAMPE satellite makes use of different layers in which the different particles can dissipate energy and be detected by their unique signatures. 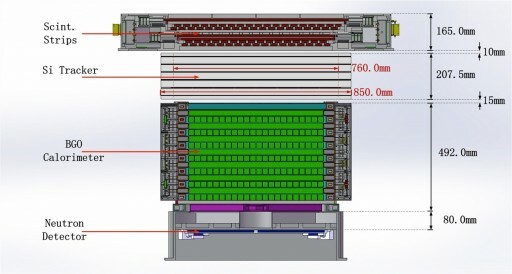 The detector system comprises the following layers from top to bottom: a double layer of plastic scintillator stripes acting as anti-coincidence detector, 6 double layers of silicon-tungsten trackers that deliver information on the direction of incoming particles, a 14-layer imaging calorimeter consisting of bismuth-germanate crystals, and finally a neutron detector using boron-doped plastic scintillators for detection. The total length of the detector corresponds to 33 radiation pathlengths, making DAMPE the deepest calorimeter deployed to space. The individual detectors are described in detailed further below. 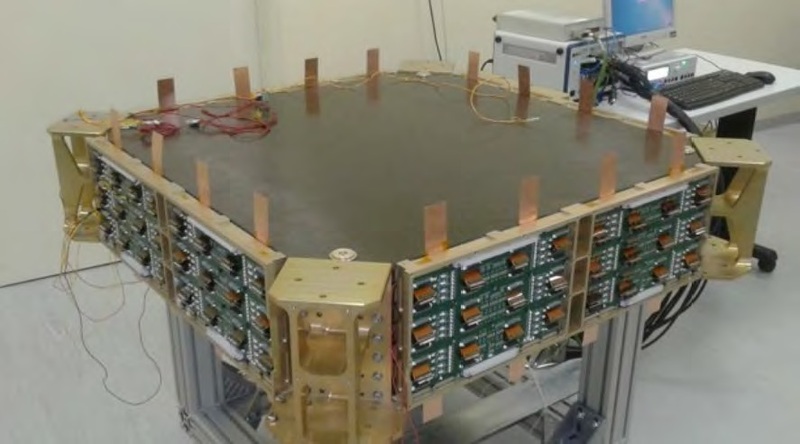 Equipped with a powerful detector system, DAMPE can measure electrons and photons with much higher energy resolution and energy coverage than existing space experiments to help in the identification of Dark Matter signatures – one of the most important areas of research in modern astrophysics. DAMPE also holds the potential of advancing the understanding of the origin and propagation of high-energy cosmic rays. The instrument covers an energy range for electrons and photons of 5 to 10 TeV at energy resolution better than 1% at 800 GeV. For cosmic rays, DAMPE has a detection range of 100 GeV to 100 TeV. Protons can be detected and measured up to 900 TeV and the operational range for heavier nuclei extends up to 1,000 TeV. 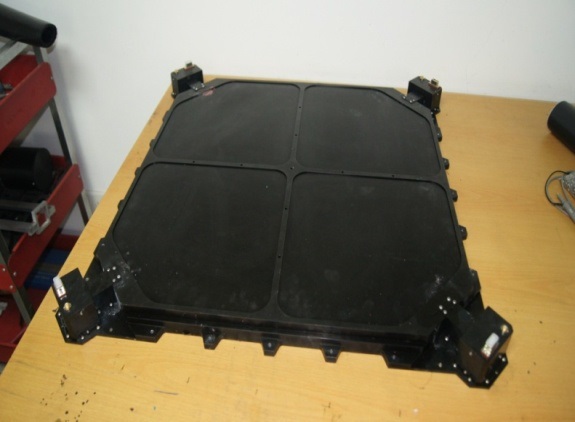 The Plastic Scintillator Array Detector consists of two layers for a two-dimensional measurement as one is arranged to measure the x-position while the other covers the y-position of the incident particle. The PSD also acts as an anti-coincidence counter for photon detection. 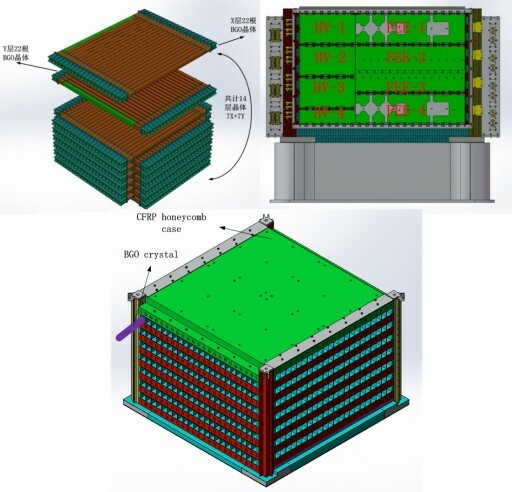 The overall coverage area of the detector is 82 by 82 centimeters and each layer is comprised of scintillating strips that are 1.0 centimeter thick, 2.8cm wide and 82 centimeters long, with strips staggered by 0.8 centimeters. The criss-cross pattern of the two layers allows the PSD to achieve a position resolution of 6 millimeters while the detector’s charge resolution is 0.25 across an operational charge measurement range of 1 to 26. Coupled with the deeper layers of the detector, PSD can be used to identify electrons and gamma rays while also discriminating heavy ion species by measuring the loss of energy encountered by the particles when passing through the PSD. Each of the PSD strip unit modules makes use of a double-end readout, delivering an output signal at each end. This yields a total of 164 high-voltage channels supported by the instrument as well as 328 electronics channels carrying the event signals. Four Front Electronics modules are used to read the signal and four high-voltage supplies deliver the 164 voltage inputs. The Silicon Tungsten Tracker is comprised of six tracking double layers, each consisting of two layers of single-sided silicon strip detectors that measure the orthogonal views perpendicular to the pointing direction of the spacecraft. Three 1 and 2-millimeter thick tungsten metal plates are located in front of layers 2, 3 and 4 for photon conversion with a total tungsten mass of 67 Kilograms creating a total radiation depth of 1.43 path lengths. Each STK ladder is comprised of four sensor elements, 9.5 by 9.5 centimeters in size, 320 microns thick and segmented into 768 strips with a 121 micrometer pitch for a total of 73,728 read out of 1,152 Application-Specific Integrated Circuits. The readout only includes every second strip, but the accuracy achieved is still around 80 micrometers for most of the supported incidence angles. The instrument uses an analog read-out circuit that allows it to measure the charge of the incoming cosmic rays. 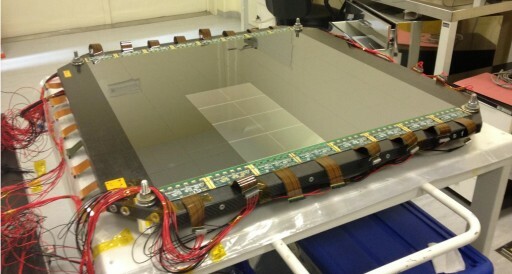 All read-out electronics are facilitated on eight readout boards installed on the four sides of the instrument. 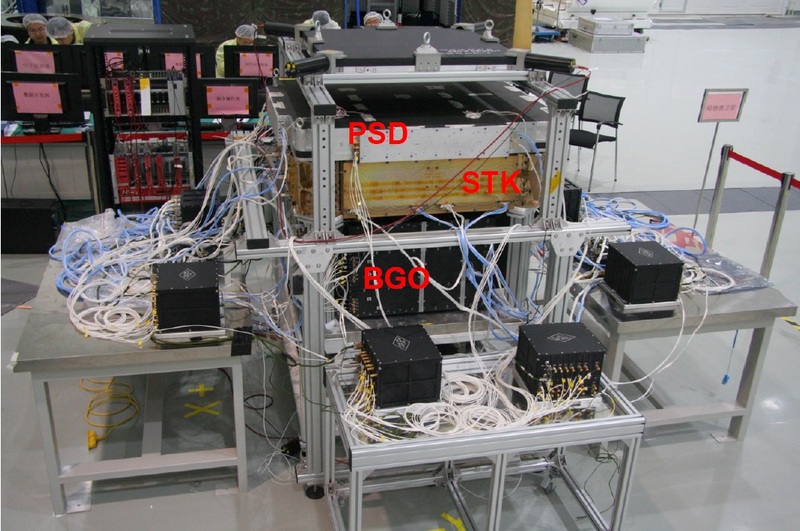 Overall, STK weighs 160 Kilograms and has a total silicon area of 7 square meters, in the same ballpark as the AMS-2 instrument on ISS. The Bismuth-Germanate Calorimeter, BGO, is composed of a total of 308 bismuth germanate crystal bars, each 2.5 by 2.5 by 60 centimeters in size. It consists of 14 physical layers (7 x- and 7 y-layers), each 60 by 60 centimeters in size for a total BGO mass of 830 Kilograms. The crystals are supported by a honeycomb case 74 by 74 by 50 centimeters in size including the 14 layer cavities filled by the BGO. Because a 0.5mm gap is left around each crystal, the instrument is filled with a silicone elastomer that holds each crystal in place and prevents damage during launch. The depth of the system is equivalent to 32 radiation lengths, surpassing AMS-2 with its 17 Xo depth. Each crystal converts particle energy to photons at visible wavelengths and photomultiplier tubes coupled to the BGO bars on each end detect the light impulses which are converted to electrical signals that can be digitized and recorded. The 616 photomultiplier tubes and detectors are installed in aluminum cases and facilitated within the honeycomb case of the instrument. 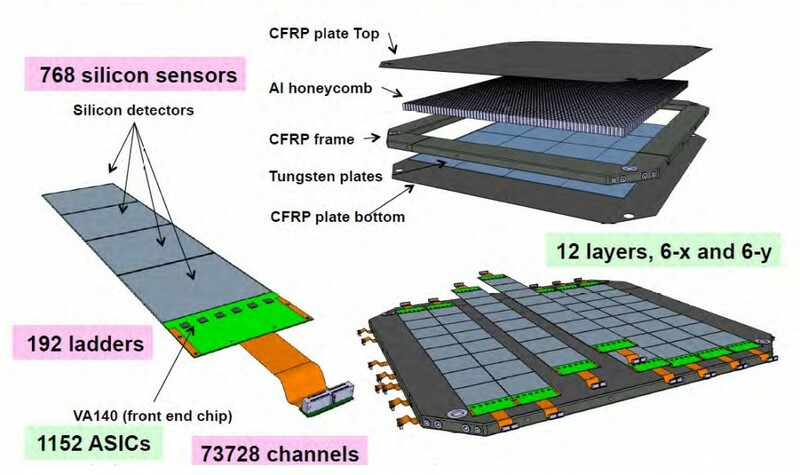 Imaging Calorimeters are characterized by a finely granulated readout with a high degree of segmentation featuring a large number of readout channels as opposed to conventional calorimeters consisting of large crystals connected to a single read-out channel. This allows for a detailed measurement of particle identity, travel direction and energy as well as the creation of Particle Flow Algorithms. Imaging Calorimeters have a sandwiched design, alternating between active detector elements and passive absorber elements. The BGO Calorimeter covers an energy range of 5 GeV to 10 TeV. An electron with an energy of 10 TeV can deposit 1.7 TeV per BGO layer and the minimum energy that can be read out is approximately 11.5 MeV. BGO uses a front-end electronics circuit with a VA32 chip. To be able to cover its high dynamic range, BGO uses a multi-dynode output system in which the different energy ranges are measured by three different dynodes – strong signals are read from the earlier stage with a small gain while small signals are read from the later stage with a large gain. 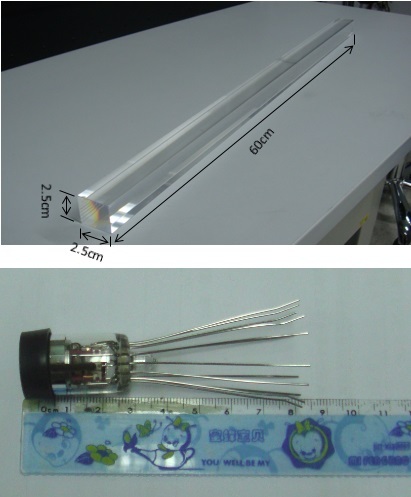 Calibration of the Photomultiplier Tubes and CCD detectors is accomplished with LED calibration sources. Located at the very base of the DAMPE instrument stack is the Neutron Detector ND that aims to identify cosmic-ray electrons and gamma rays at energies higher than 100 GeV. ND consists of four large-area boron-doped plastic scintillators, each 30 by 30 by 1 centimeter in size with a 5% boron density. Each is read out by an independent Photomultiplier Tube. 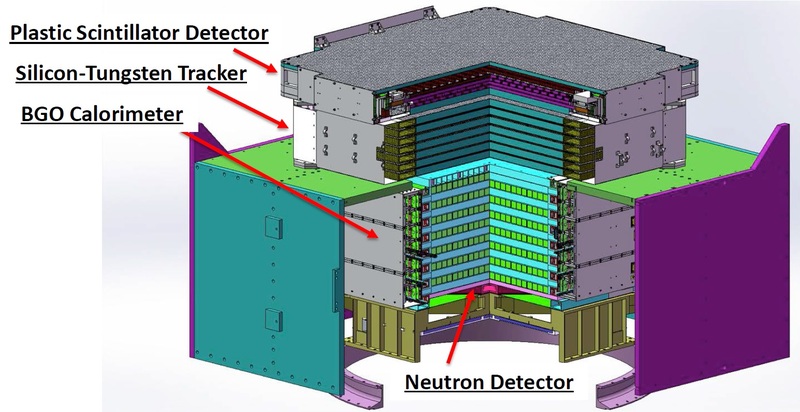 ND can detect delayed neutrons that are the result of a hadron shower within the instrument in order to improve the electron/proton separation accuracy of the instrument system. The Boron can be excited by incoming neutrals, yielding alpha particles, 7Li and gamma-rays. The latter are converted to light pulses detected by the Photomultipliers coupled to a sensitive detector. DAMPE aims to study dark matter by gamma-rays arising from dark matter annihilation or decay together with measurements of the electron/positron pair spectrum. This, scientists hope, will permit them to constrain the physical parameters of dark matter such as the rest mass, annihilation cross section or lifetime. The instrument counts and measures both, electrons and their anti-matter counterparts, positrons. Electrons and positrons are produced by cosmic ray interactions, but they could also be created by the annihilation of dark matter particles – the problem physicists and astrophysicists are facing is to tell the difference in order to conclusively confirm the existence of dark matter by a direct measurement. Based on models of particle interactions alone, the positron fraction would show a steady decrease with increasing energy. This is because particle sources such as supernovae emit a large amount of high energy electrons, but high-energy positrons occur less frequently – causing the ratio between the two to drop with increasing energy. 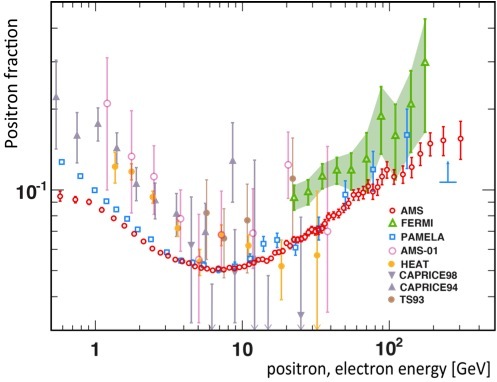 But about two decades ago, scientists discovered that the positron fraction shows an increase at energies of 10GeV or greater which caused a lot of speculation about the origin of this excess in positrons – DAMPE with its broad operational energy range is hoped to provide new insights. A popular dark matter theory proposes that dark matter consists of weakly interacting massive particles – WIMPs – which, when colliding, create an electron-positron pair at energies limited by the mass of the WIMPs. In this scenario, the positron fraction would increase up to a certain point and then rapidly fall when reaching a cutoff energy. So far, no such cutoff point could be definitively measured.